The Kia Sorento has been named as Total 4x4's Best SUV for the second year in a row - beating off keen competition in a well-established segment. Editor Alan Kidd said: ‘The Sorento was our reigning champion in the full-size SUV class, and it impressed us every bit as much this year as last. Its style, poise, kit and practicality all score heavily in its favour. 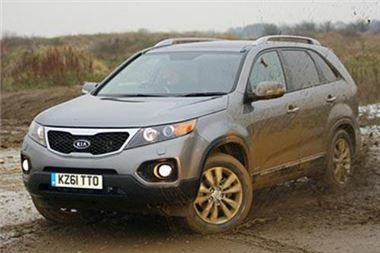 The latest version of Kia's full-size 4x4 Sorento was launched in the UK in February 2010 and immediately impressed the Total 4x4 team. It remains the flagship of the Kia range and is available in two and four wheel drive versions - but it is the full-time four wheel drive model that again impressed the Total 4x4 judges to retain its Best SUV crown. Michael Cole, Managing Director of Kia Motors (UK) Ltd., said "From the day of its launch we knew that the latest Sorento continued the car's impressive record of delivering excellent go-anywhere ability coupled with on-road sophistication at a great value price. Sorento has been a long-time favourite in the Kia range and its popularity amongst a wide variety of customers - from those who want on-road towing security or all-weather ability to the more adventurous owner who needs to head away from the main roads. "I am delighted that Total 4x4 has again awarded Sorento its Best SUV accolade - especially in the face of so much impressive competition in what remains a hard-fought sector of the market," he added. The Total 4x4 awards issue is released today - Friday December 16.